The primary use of genetic variation in resistance is for breeding animals for enhanced resistance to specific diseases. Whereas breeding will produce permanent benefits, it may be slower and logistically more complicated than other disease control measures, and often will only be considered when other strategies are unsatisfactory. In general, breeding will be justified if: 1) there is a disease of major importance; 2) current control strategies are not adequate, sustainable, or cost-effective; and 3) available animals do not cope with these disease challenges. 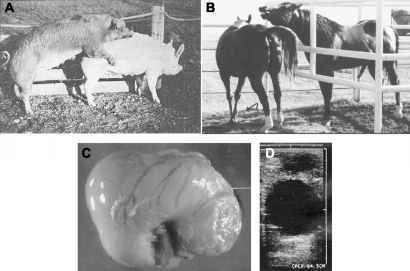 A successful breeding strategy should cost-effectively reduce the impact of the disease, i.e., alter disease epidemiology, in a reasonable time period. Breeding strategies vary in sophistication. For example, choosing the appropriate breed for the environment may be the major requirement. In tropical production systems, this may mean choosing a resistant local breed ahead of an apparently more productive exotic breed that does not have resistance attributes necessary to survive local disease challenges. Appropriate within-breed selection strategies will depend on the disease. Phenotypic indicator traits following natural infection will be useful when there are nonacute endemic infections, such as nematode infections, mastitis, or tick infestations. Genetic progress may be boosted, or infectious challenges avoided, if genetic markers of resistance are available. Epidemic diseases, or those with severe impacts upon the animal, will generally require genetic markers for breeding purposes. The effectiveness of marker-based selection will depend on the proportion of variation in resistance accounted for by known allelic variation at the resistance gene(s). Genetic variation in resistance has been exploited for several diseases. For Marek's disease, genetic strategies have been successfully used for many years, in the face of an evolving pathogen, to assist in disease control. Many national dairy cattle breeding schemes now include mastitis resistance in their breeding goal, with the aim of limiting increases in mastitis impact arising as a consequence of increasing milk production. Individual sheep breeders in New Zealand, Australia, and the United Kingdom now select for nematode resistance to improve performance and decrease treatment requirements. Furthermore, sheep industries in Western Europe are currently selecting on PrP genotype to minimize the risk of TSEs. Beef cattle industries in several countries have altered breed choice to reduce the impact of tick infestations. Many other examples of deliberate and natural selection exist. As with all disease control strategies, pathogen or parasite evolution is a risk. This risk will generally be minimized by combining complementary control strategies, e.g., by using genetics along with appropriate interventions or biosecurity measures.